Game of Thrones fans are some of the most loyal when it comes to television and film besides Star Wars and Harry Potter. President Obama and many other well known famous people have even been known to enjoy watching award winning fantasy show! Is your significant other obsessed with the hit HBO TV show Game of Thrones which is based on George R. R. Martin’s A Game of Thrones 5-Book Series and stars Peter Dinklage along side Hollywood beauty Emilia Clarke?! 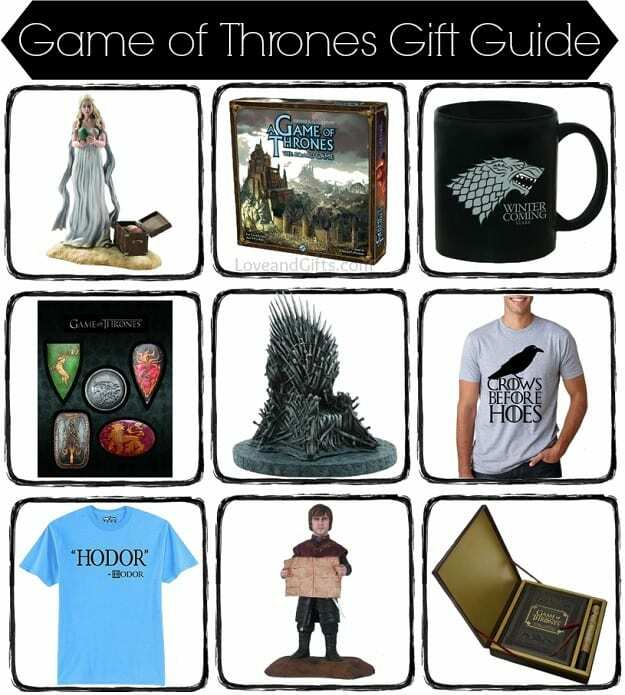 If they already own the DVDs, next time their birthday or your anniversary rolls around on the calendar, get them one of these thoughtful and unique gift ideas for Game of Thrones fans. Our Games of Throne fan gift guide features everything a true fan needs from decorative accessories to trivia games and puzzles. When they open up their Game of Thrones inspired gift, they’ll definitely appreciate that you let them indulge in their GOT fandom! Character figurines like the Game of Thrones Daen and the Game of Thrones Tyri are a neat gift idea for your Game of Thrones fan to display around the house or on their desk at the office. Most of the other characters including Arya and Robb Stark are also available! Besides character figurines, there are other Game of Thrones decorative pieces which are perfect gifts to give to any GOT fan like the Game of Thrones: Iron Throne 7″ Replica or this extremely unique Game of Thrones Table Lamp . Make sure your GOT fan has is prepared with some Game of Thrones mugs and glasses for drinking their favorite drink of choice. The Dark Horse Deluxe Game of Thrones 11 oz Coffee Mug is great for morning coffee or tea, while the Dark Horse Deluxe Game of Thrones Pint Glass Set is more ideal for soda, water or beer and the Dark Horse Deluxe Game of Thrones Shot Glass Set is for cordials and liquors. Let them express their Game of Thrones obsession with other accessories for around the home such as the Game of Thrones Shield Magnet Set and the Game of Thrones Sigi Coaster Set ! Other great gift ideas for Game of Thrones fans are cool games and puzzles including these Game of Thrones Playing Cards and this two player Game of Thrones Card Game which feature fan favorite characters from both the houses of Lannister and Stark. Game of Thrones board games like A Game of Thrones: The Board Game Second Edition and puzzles like the 4D Cityscape Game of Thrones: Westeros Puzzle are also really fantastic gifts any GOT fan would love to own! Any true GOT fan probably already owns George R. R. Martin’s A Game of Thrones 5-Book Boxed Set , but there are other books you could look at gifting them with such as Game of Thrones: A Pop-Up Guide to Westeros and Inside HBO’s Game of Thrones: The Collector’s Edition . If your guy is a fan of Game of Thrones, you may want to consider getting him something like a t-shirt or other clothing items he can wear around so he can show off his personal style and his GOT pride. A few of the most popular Game of Thrones men’s shirts are this Winter Is Coming Circle T-Shirt , this Fire and Blood Splatter T-Shirt , the 3 House Symbols T-Shirt or the humorous Crows Before Hoes Funny Crow Shirt . Girls are absolutely Game of Thrones fans as well! This Game Of Thrones House Targaryen Dragon Sigil T-Shirt or the Khaleesi The Dragon T-Shirt are both wonderful gift ideas for your GOT loving lady! Ideas for other clothing items that can be worn by both men and women Game of Thrones fans are this comical Hodor Hodor Quote T-Shirt and the stylish and warm Game of Thrones – House of Targaryen Scarf . Game of Thrones is such a popular show drawing in audience into the millions! Whichever Game of Thrones gift you decide to give your GOT loving lover, he or she is bound to appreciate it because it comes from such a thoughtful place, the heart! Which Game of Thrones gift idea is your favorite? Sound off in the comments below!